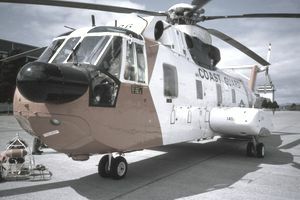 Coast Guard Aviation Maintenance Technicians (AMTs) perform ground handling and servicing of aircraft and conduct routine aircraft inspections and aviation administrative duties. AMTs inspect, service, maintain, troubleshoot, and repair aircraft engines, auxiliary power units, propellers, rotor systems, powertrain systems, and associated airframe and systems-specific electrical components. They service, maintain, and repair aircraft fuselages, wings, rotor blades, and fixed and movable flight control surfaces. As part of the aircrew, AMTs hoist rescue swimmers and survivors, drop supplies and emergency equipment and assist pilots. AMTs are technology and troubleshooting experts, fixing and maintaining everything from fuel systems to flight controls in a variety of aircraft. No Coast Guard air mission would be possible without an AMT; it’s an extremely important position. AMTs are stationed at Coast Guard air stations, both large and small, located throughout all 50 states and in Puerto Rico. AMTs are responsible for maintaining and servicing fixed-wing aircraft, including HC-130H and J (Hercules), HC-144 (Ocean Sentry) and the HU-25A (Falcon). They also maintain rotary wing aircraft: HH60J (Jay-Hawk) and HH-65A (Dolphin). Large air stations house several different types of aircraft, whereas smaller air stations have just one. Regardless of where an AMT is stationed, they need to possess an extensive amount of aircraft knowledge. The average salary for a Coast Guard AMT is about $50,000. As an active duty member of the Coast Guard, you will be granted an exceptional benefits package, including complete medical, dental, and vision coverage; life insurance; a housing and meal allowance; 30 days of paid vacation annually; college tuition assistance; and retirement plans. Depending on position and rank, some Coast Guard members get the opportunity to travel around the world at no cost while on active duty. The ASVAB score requirements to be an AMT is AFQT=65 or AR + MC + AS + EI = 220, with a minimum AR of 52. If you’re unfamiliar with the ASVAB, it’s a military aptitude test that predicts future academic and occupational military success. When taking the ASVAB, remember to read and listen to directions carefully, and ask questions if you have any. The ASVAB is taken on a computer, and only a few keys are required to complete the test. If you accidentally press an invalid key, your entire test may be considered invalid, and you’ll have to take it again, so take your time. Before attending AMT “A” School, AMTs must complete a training course and receive a unit Commanding Officer’s recommendation to proceed. AMT “A” School is a five-month course held at the Aviation Technical Training Center in Elizabeth City, NC. Future AMTs will take courses in aircraft maintenance fundamentals and advanced courses that cover specific aircraft systems and troubleshooting techniques. AMT training can also prepare you for careers beyond the Coast Guard. As an AMT, you can apply for the AMT Advanced Education Program (AEP). The few AMTs who successfully make it through the application and selection process are granted the opportunity to attend college full time for at least two years and can earn an associate or bachelor’s degree in aviation maintenance technology. What Do I Need to Know Before Boot Camp? Can You Take Early Retirement From the Guard or Reserves?